Inspiring women are go-getters. They make things happen. They live life with no regrets. They are learning about themselves and reaching their full potential. They are not afraid to take risks and just go for it. 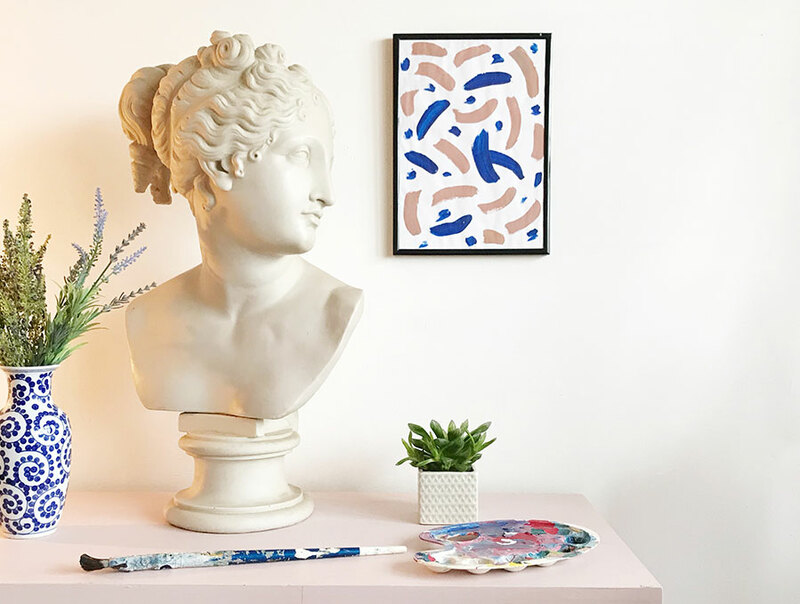 Since Anna Williams from House Anna is joining our team as a contributor and writer, it’s only appropriate that I talk to her about her journey and pattern design work. WHAT HAS BEEN YOUR JOURNEY SO FAR? I was born in London during the 80’s and spent most of my childhood living amongst rubble whilst my parents developed houses in Chelsea. We moved out to the Worcestershire countryside when I was eight and I’ve lived the rural life ever since, although I frequently dip my toes in and out of London and can’t go for more than a couple of weeks without a trip to the big smoke. I’ve always been involved in creative based industry having worked at French Connection HQ in my 20’s, assisted in the design and build of a luxury hotel, and launched an online gifting boutique after my first baby was born. I had a mild midlife crisis at the age of 30 and joined a film extra agency which was a pretty amazing experience, and one which I would highly recommend. 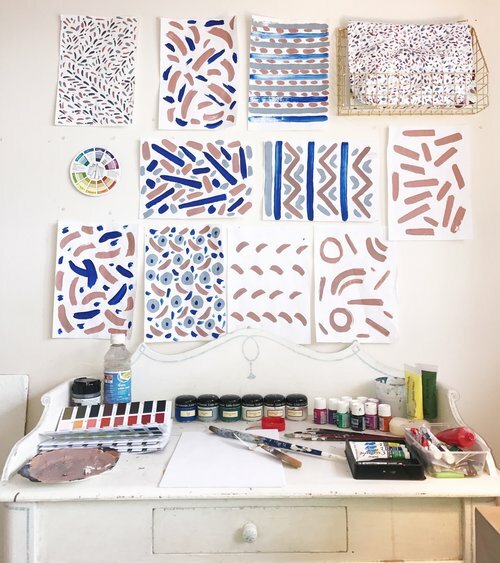 I then worked at an arts magazine and took a course in Ancient Greek Civilisation which led me in a roundabout way to focus more on my creative side and I set about designing wallpapers to decorate my house with. 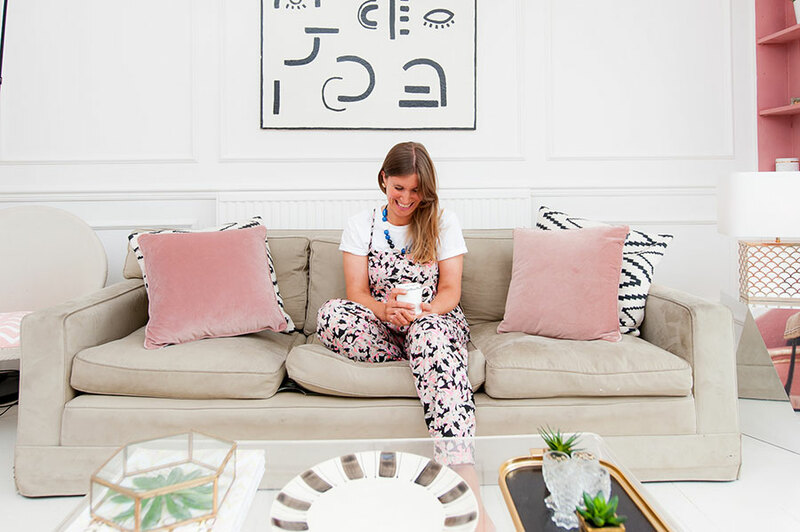 It was after having my second baby Harriet that I started the blog as my ever-growing obsession with interiors that started as a child reached tipping point. I absolutely love writing the blog and it’s a joy to meet such inspiring and talented creatives as a result of it. 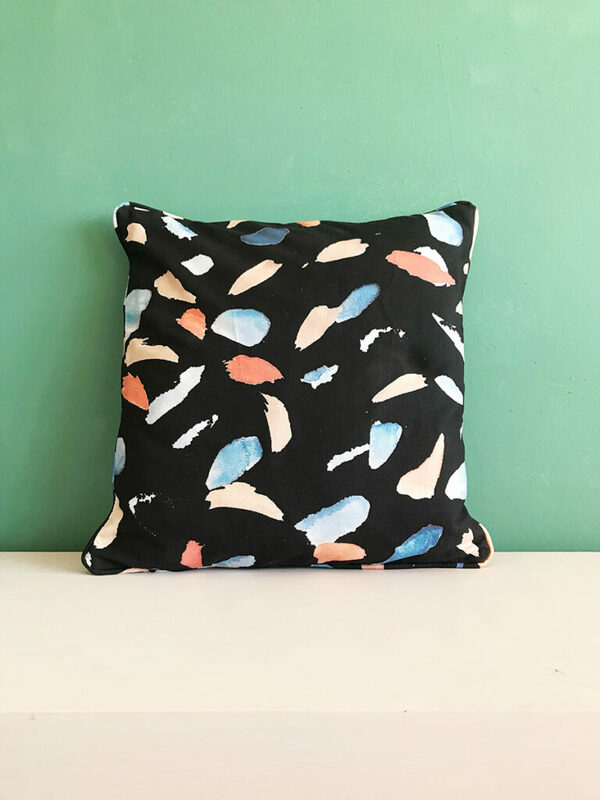 I’m currently working on creating designs to turn into a collection of homewares for the blog shop which is all about combining abstract hand-painted pattern with a chintzy feel. HOW WOULD YOU DESCRIBE YOUR OWN STYLE IN HOME AND LIFE? I love timeless tradition mixed in with contemporary and quirky accents both at home and in fashion. I love nothing more than a cashmere jumper and jeans with whacky accessories such as 80’s inspired jewelry and patterned brogues. Interior design wise I love a touch of Granny Chic, blending the old with the new, a contemporary abstract painting is a must and I love to paint. I’m obsessed with Georgian architecture, Matisse and 1980’s Laura Ashley; frills and fringe are my passion. WHY DID YOU DECIDE TO CHANGE THE NAME OF THE YOUR BLOG TO HOUSE ANNA? I started the blog nearly two years ago not really thinking it would amount to all that much, so I used my old online boutique name to set it up with, which was Camilla Pearl. Camilla is the name of my daughter and Pearl was my grandmother’s name so it reflected the old and new pretty nicely in my head at the time, however it was confusing for other people who thought my name was Camilla, it was always a tricky name to explain. 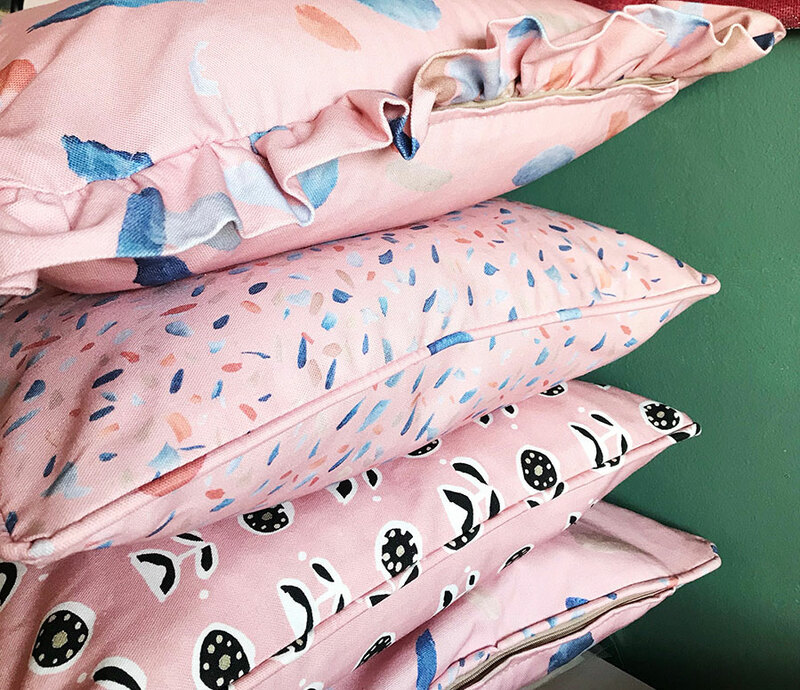 When I decided to start designing my own collection of prints for homewares it just didn’t really make sense anymore and I had to think more about the long-term picture of the blog and business, that’s when I decided to rebrand as House Anna. I love interior design and also adore fashion, home life and travel so it would be great to explore these themes more on the blog in the future all under the roof of House Anna. The name House Anna is also easy to remember and kind of says it all, sometimes practicality overrules! I actually kept the domain name and all the branding for Camilla Pearl, and have given it to my 9-year-old, the real Camilla who wants to take it over and start something up herself one day. YOUR WEBSITE IS FULL OF COLOUR, HOW YOU DO YOU THINK COLOUR HELPS YOU IN TERMS OF CONFIDENCE IN INTERIORS AND YOUR DESIGN WORK? I’m more on the muted colour side of the spectrum which I suppose links in with my Summer personality, a concept I learned all about in a book called Style Your Brand by Fiona Humberstone. I love soft pinks, greys and whimsical shades with the odd speck of dramatic black. I think once you are in tune with what colours really reflect your personality, it gives you a sense of confidence and comfort which for me, also helps when helping people design their own spaces. I would love to work on a fabric design collaboration with Burberry, have my own magazine column; writing has become an absolute passion of mine, and travel around India and the USA in search of great design – I’m aiming high! If I can continue to combine my love of writing with art & design then I’ll be a happy bunny. You can follow Anna on @house_anna_ . For latest updates please visit houseanna.co.uk.